Congratulations BSPH Community Health students Mark Daiuto and Korissa Waelbroeck on making the IUPUI Top 100 Students. They will be honored at the IUPUI Top 100 Outstanding Students Recognition dinner on March 31 at the Indianapolis Marriott. Join us in congratulating Mark and Korissa on this honor. This seminar is available for CME credits. Dr. Brian Dixon co-authored a new article entitled “Data Quality at the Indiana State Cancer Registry: An Evaluation of Timeliness by Cancer Type and Year” published in the Winter issue of the Journal of Registry Management, a publication dedicated to the management of health registries and the collection, management and use of cancer, trauma, AIDS and other health registry data. The article, whose lead author is a graduate of the IU School of Informatics and Computing whom Dr. Dixon mentored, focuses on exploring the timeliness of cancer case reporting using data from the Cancer Registry at ISDH. Using ten years of data for breast, lung and colorectal cancer, the article found that the timeliness of reporting increased since 2003 when ISDH implemented a new case management system. Yet the timeliness of reports varies based on the cancer type, and there is room for improvement. The article suggests other ways that health information technologies might contribute to cancer case reporting processes. The article is available online. 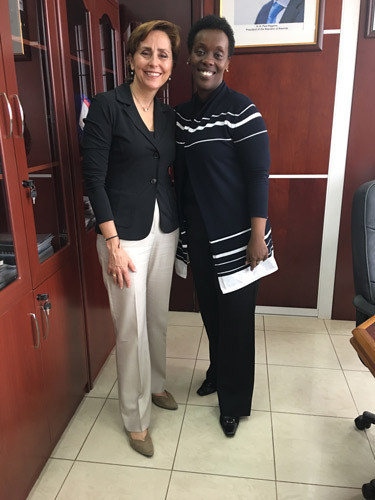 Dr. Sue Babich met with the new Rwandan Minister of Health, Dr. Diane Gashumba. Dr. Gashumbais eager for us to send two more students this summer for the Rwanda Summer Fellows Program, our internship program in Rwanda funded by the Rockefeller Foundation. 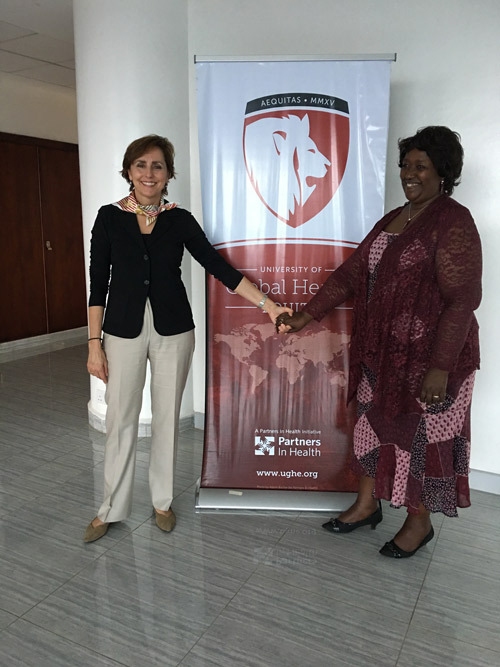 Dr. Babich also met with the forner Rwandan Minister of Health, Dr. Agnes Binagwaho, at the University of Global Health Equity, where students from around the world receive field-based educations in improving health systems. The Richard M. Fairbanks School of Public Health is proud to announce that we have three $2,500 scholarships available in the spring of 2017 and 2018 for full-time students pursuing a graduate degree. Please encourage your students to apply. More info can be found here. Indiana University has added a new tax advantage to the IU Tuition Benefit Plan. This enhancement allows certain graduate tuition benefits, that were previously a taxed benefit, to be tax-free beginning January 1, 2017. When an employee receives an IU Tuition Benefit subsidy for graduate classes, this amount will no longer be added to gross income until the subsidy reaches $5,250 each year. Amounts above $5,250 will continue to be added to the employee’s taxable gross income as required by current IRS regulations. The undergraduate tuition benefit for an employee, spouse or child will continue to be tax-free as allowed by the IRS. The IRS does not allow graduate tuition benefits for a spouse to be tax-free. The entire amount of the spouse’s graduate subsidy will continue to be added to the employee’s taxable income. The first tuition benefit subsidies affected by this change are those for the 2017 Spring semester (and Fall 2016 subsidies awarded in 2017). As in the past, University Tax Services will notify employees 4-6 weeks before any graduate tuition subsidy is added as taxable income so the employee can plan for the additional taxes in their paycheck. The timing of these taxes will depend on when the employee exceeds the $5,250 threshold. This preferential tax treatment is currently allowed under Internal Revenue Code Section 127. With each change in presidential administration there is the potential for major tax reform. IU Human Resources will notify employees of any such changes that affect the preferential tax treatment of this or other university benefit plans. To apply for the IU Tuition Benefit go to One.IU and search for Tuition Benefit. Whenever possible, lock your bike to a bike rack and avoid locking it to items that can be easily cut, broken, or removed. USE a steel "U" shaped lock, and remember--two locks are better than one. Lightweight cables or chain locks NO longer provide adequate security in most areas. Leave as little space as possible within the "U" of the lock to make it harder for thieves to pry it open. Keep the lock off the ground to avoid giving it the leverage to smash it. Position the lock keyhole so it faces the ground. This will inhibit a thief's ability to manipulate the lock. Remove the front wheel and lock both the wheel and frame together with the "U" if it's a quick release wheel. Take your bike seat with you if it's easily removable and/or expensive. You can and should register your bicycle with Parking Services, located at the Vermont Street Garage(1004 W. Vermont Street-1st floor-west end-317-274-4232). Record the make, model, and serial number of your bicycle and take digital photos to assist police in locating and identifying your bicycle in case it's stolen. Please contact IU Police at 317-274-7911, 24 hours a day if you need to file a report of your stolen bicycle. Join Indiana University and Fidelity for an exclusive educational workshop, where you’ll learn strategies and tips to help you manage your financial future with confidence. Learn why financial wellness is so important for women, essentials to building a budget, balancing savings and debt priorities, investing basics and defining your investing personality. A light lunch and refreshments will be served. Space is limited, so please register in advance by visiting www.getguidance.fidelity.com. The Office of the Vice Chancellor for Research (OVCR) at IUPUI is pleased to offer a sequence of two workshops during spring semester 2017 for highly qualified assistant professors interested in applying to the NSF Faculty Early Career Development (CAREER) Program. This program is an NSF-wide activity offering NSF’s most prestigious award in support of junior faculty who exemplify the role of teacher-scholars through outstanding research, excellent education, and the integration of research and education within the context of the mission of their organizations. Additional information regarding the workshops can be found on the OVCR Workshops page under February events at: http://www.research.iupui.edu/news-events/events/workshops. More detailed information regarding the NSF CAREER program can be found in the NSF program solicitation (NSF 17-537) at: https://www.nsf.gov/pubs/2017/nsf17537/nsf17537.pdf. General questions ahead of the workshops can be directed to Steven B. Chin, PhD, IUPUI Office of the Vice Chancellor for Research. If you know of students interested in gaining hands-on experiences in cancer research, encourage them to apply to the IU Simon Cancer Center's 2017 Summer Research Program. Students are paid in the nine-week program (June 5-July 28). The Summer Research Program's primary goal is to increase the number of underrepresented populations engaged in basic, clinical, and prevention and control cancer research by providing positive and meaningful first-hand exposure to those fields. The application deadline is Feb. 28, 2017. The application and more information can be found at www.cancer.iu.edu/srp. Next Generation 2.0 supports mid-career faculty and professional staff at IUPUI who are women and/or members of underrepresented populations who are interested in seeking leadership opportunities at IUPUI or professional development to enhance their current roles. The program seeks to address the need for a more diverse pool of leadership talent at IUPUI in the ranks of mid-level and upper administration. Application for the third cohort can now be made online at the program website. Applications are due Monday, March 6, 2017 by 5:00pm. The Bantz Community Fellowship provides one year of support for a collaborative research team (i.e., faculty, student(s), community partner/members) to address a community issue in Central Indiana. To be eligible to serve as PI on a Bantz Community Fellowship team, the faculty member must have a full-time appointment (Tenured, Tenure-track, Clinical Faculty or Lecturer). The Bantz Community Fellowship will be awarded through a competitive application process on an annual basis. Proposals may request up to $50,000, with a required additional cash or in-kind match (minimum 20%) from the school, community partner, and/or other grants and partners. Applicants to the Charles R. Bantz Chancellor’s Community Fellowship must complete all sections of the application form. Applications are due by 5:00 pm, Monday, March 6, 2017. The Assessment Institute invites you to submit proposals for the 2017 conference. The Institute, hosted by IUPUI, is now the nation’s oldest and largest event focused exclusively on outcomes assessment in higher education. Please consider submitting a proposal on or before the priority deadline of March 10, 2017. Proposals may continue to be submitted after that date and considered for acceptance based on capacity. We would be particularly pleased to receive proposals addressing any of the topics listed in the bullet points below. The Institute will feature special track plenary sessions and workshops emphasizing assessment in community engagement, ePortfolios, faculty development, global learning, graduate education, high impact practices, NILOA, STEM education and student affairs programs and services. To submit a proposal, please visit http://assessmentinstitute.iupui.edu/program/proposals.html. Indiana University provides abundant advanced computing resources for all IU faculty, staff, and students. Highlighted here are opportunities to help you advance your research or academic endeavors. These workshops will help you learn more about advanced computing. so you can reach new discoveries faster, crunch data more efficiently, and work with systems that enable your students to become more adept with technology. Visit the UITS event calendar to register and view updates and additions. Short IT workshops at no cost for students, faculty, staff, provided by UITS IT Training. Get the information you are looking for and get back to your classes or office in an hour or less! Walk-ins welcome, or register in advance at ittraining.iu.edu. Questions? Email ittraining@iu.edu or call 317-274-7383. The Red Alliance invites you to the Breast Health Summit on February 25, 2017, 9am to 3pm. There will be workshops, mammograms and health screenings. For more information please email redallianceindy@gmail.com.